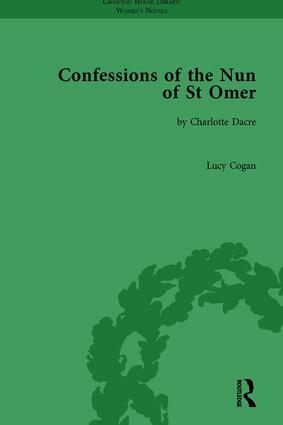 Charlotte Dacre’s debut novel Confessions of the Nun of St Omer (1805) was a bestseller in its day, launching the career of a woman who would go on to become one of the nineteenth century’s most notorious female novelists. The work tells the story of the wilful Cazire, who recounts her passionate and destructive youthful adventures from the convent where she now lives in seclusion. Although Dacre’s fame, then and now, rests largely on her sensationalist plots and portrayal of sexually self-possessed female villains, Confessions of the Nun of St. Omer shows a different side to her writing, one that is engaged in the political debate surrounding the French Revolution and eager to uphold the conservative moral line. Indeed, in many ways the novel strives to exemplify the moral and social orthodoxies of its time – dealing with themes of education, passion, seduction and the dangers of the radical ‘new philosophy’. Yet even at this early stage of her career the author’s frank exploration of the power of female desire reveals a willingness to experiment with themes left untouched by more conventional Romantic era novelists, themes that would dominate her writing for years to come. This edition of Charlotte Dacre’s book is based on the Chawton House Library copy of the text from 1805 and contains textual notes. The book will be of interest to those researching the Gothic, women’s writing and the development of the nineteenth-century novel.